The cathedral was one of the earlieststructures built with exterior flying buttresses. They were constructed around its nave in the 12th century to lend support to the thin walls, after the need for more light in the incredibly tall church required larger windows, and thus greater supports. 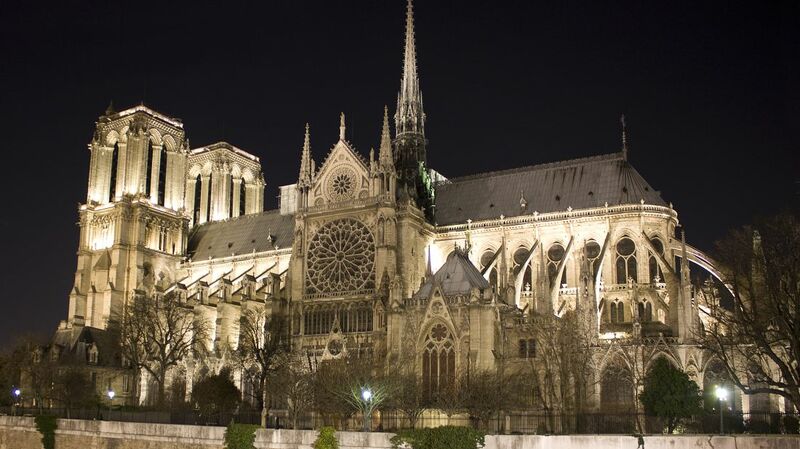 The exposed flying buttresses became an iconic aspect of Gothic design, and although there’s some debate over whether Notre-Dame was the first church to have them, they certainly set the trend in sacred architecture. The kings weren’t the only part of Notre-Dame destroyed during the French Revolution. The cathedral, like other churches around France, was transformed in the late 18th century from a Christian space and rededicated to the new Cult of Reason. All 20 of its bells—except the colossal 1681 bourdon called Emmanuel—were removed and melted downto make cannons. Some of the most popular images of Notre-Dame are from the perspective of its gargoyles or chimera (the carved monsters that don’t act as waterspouts). Few visitors would guess that the fantastic creatures now on the cathedral weren’t there until the 19th century; they were addedbetween 1843 and 1864 during the radical restoration overseen by Eugène-Emmanuel Viollet-le-Duc.